If you want to experience the best diving that Thailand has to offer, come to the Similan Islands. The best way to experience these islands is on a liveaboard. But, with so many boats and itineraries out there, how do you know what’s the best Similan Islands liveaboard for you? The Similans are a chain of 9 tiny islands and the surrounding waters are part of a protected marine park. There are over 25 dive sites in the park that are packed with life. There’s the big stuff, the mantas and whale sharks. And, there’s also plenty of critters to discover in the sand. 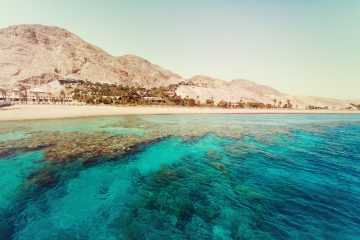 This article is a quick guide to walk you through what to look for when planning your dive vacation. 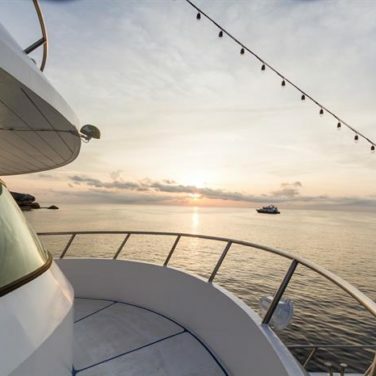 We’ll walk you through everything you need to consider when choosing a liveaboard and then compare some of the best boats so you can decide which one is right for you. 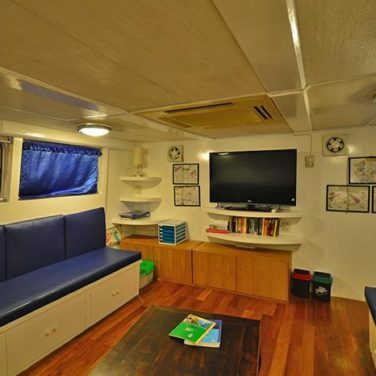 If this is your very first liveaboard dive trip, the Pawara is an outstanding choice. Cabins are available at multiple price points, including shared budget accommodations. This boat also offers Nitrox certification, and free Nitrox for qualified divers. 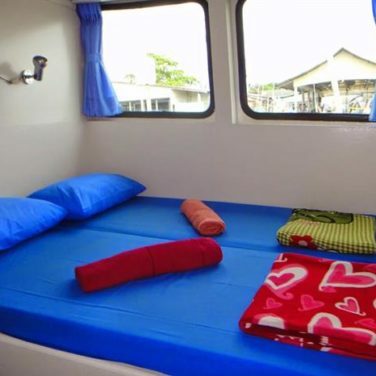 And, it’s easy to spoil yourself with little perks like free internet and hot towels after every night dive. 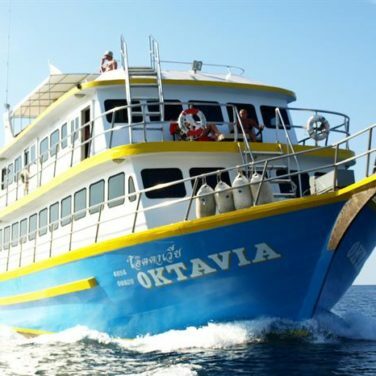 If you’re looking for a quick trip or have non-divers in your group, the Oktavia might be your best bet. 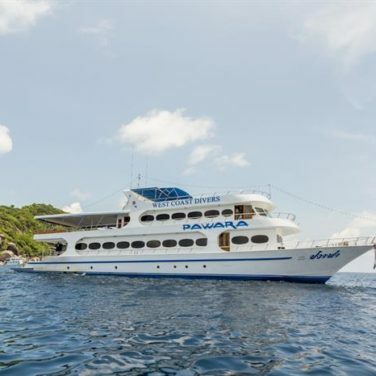 This boat offers onboard courses beginning with Discover Scuba Diving, daily excursions for snorkelers, and is a top pick for families traveling with children. And, a range of itineraries lasting between 2 and 6 days, make it easy to see as much or as little of this region as you like. 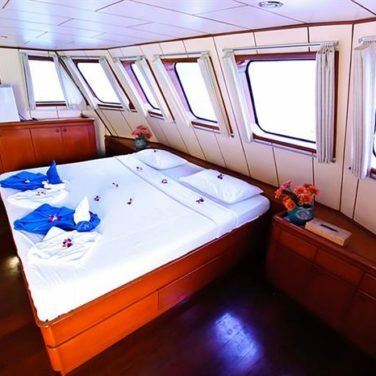 When it comes to budget liveaboards in the Similan Islands, divers have plenty of options. This top rated boat is easily one of the best. Shared cabins and bathrooms, and buffet style dining, help keep trips extra affordable. But, guests can expect outstanding service above and below water. Rental equipment is included in this boat’s prices, and courses are offered, beginnig with Open Water. If you’re looking for an extended or unconventional liveaboard itinerary, this boat is your best option. Creative routes combine the Similan Islands, Mergui Archipelago, and southern Andaman Sea. And, with voyages lasting between 5 and 8 days, there is a trip suited to every budget and timeline. 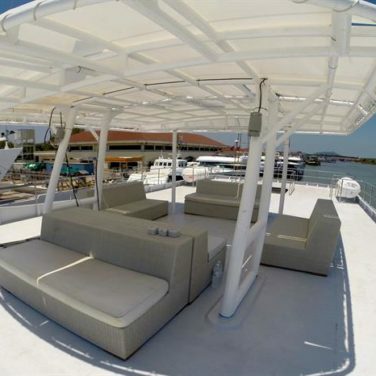 Free internet, photographer friendly facilities, and an oversized dive deck add value. 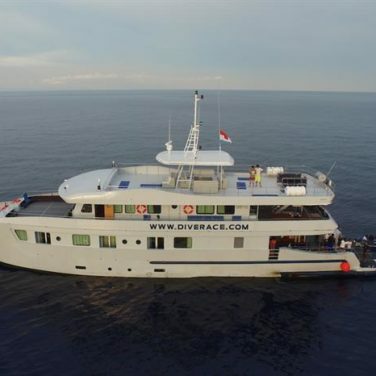 Even the most experienced divers will be impressed by this boat’s spacious dive deck, photography facilities, individual gear storage, and support for tech and rebreather divers. And, creative itineraries throughout the Similan Islands and southern Andaman Sea mean plenty of opportunities for deep, wreck, and drift diving. 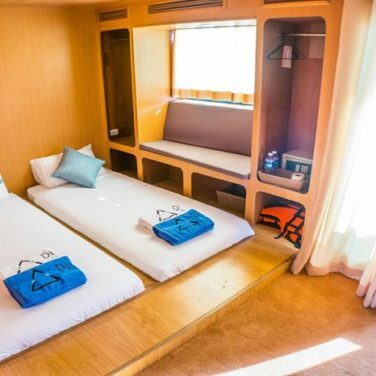 Other onboard perks include an oversized saloon, highly rated meals, Thai massage, and multiple sun decks. When it comes to luxury liveaboards, The Aggressor Fleet never disappoints. 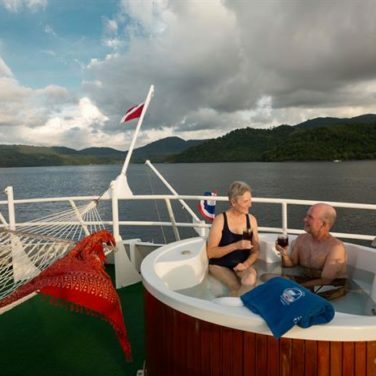 This boat’s creature comforts include an on deck hot tub, complimentary beer and wine, spacious and modern cabins, and chef-prepared meals. 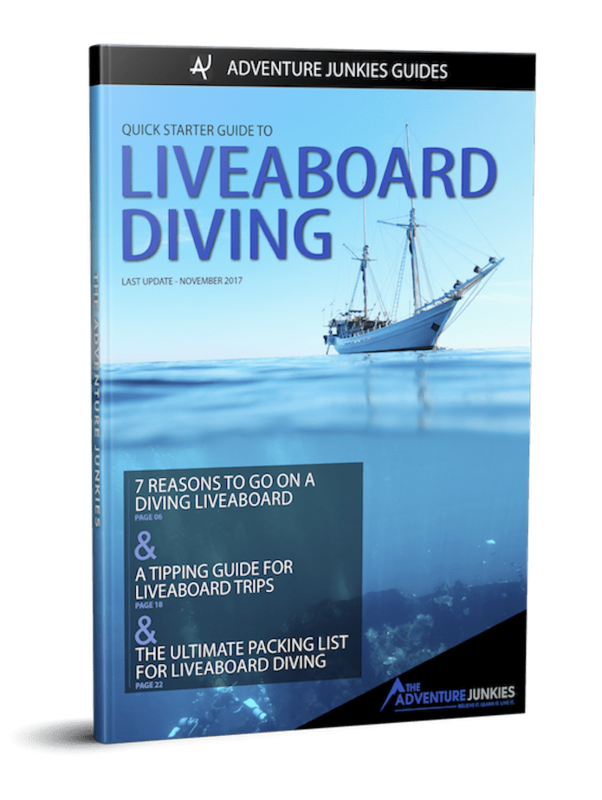 With up to 5 dives a day, serious divers can make the most of their time onboard. And, if you have time to spare, this boat’s 8 day itinerary is one of the archipelago’s very best. Beginner. Thanks to calm, clear water, and gentle currents, the Similan Islands are a perfect destination for newly certified divers. And, if this is your very first liveaboard dive trip, you’ll find yourself in good company. Most boats in this region offer courses onboard, including Discover Scuba and Open Water, making the islands a popular place to get certified, too. 2 to 8 days. Most liveaboards in this region spend 4 to 6 days cruising around the archipelago. Quick 2 and 3 day routes, perfect for weekend warriors, explore the most famous dive sites and nothing more. 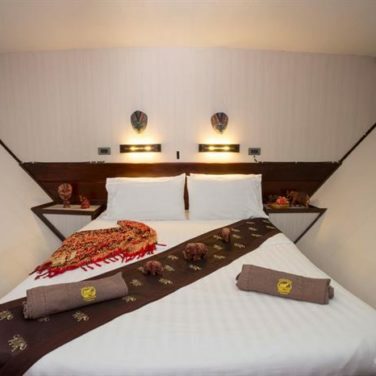 But, if you have time, extended itineraries combine the islands with nearby destinations like the southern Andaman Sea and the Mergui Archipelago. 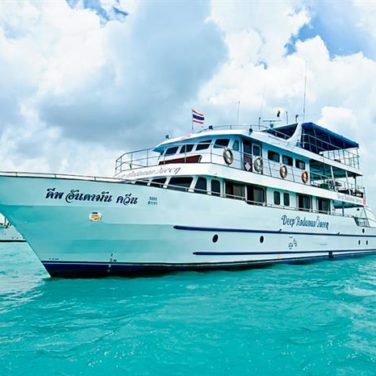 The liveaboard dive season in the Similan Islands runs from October through May. During these months, conditions are at their very best. And, closing the park for 6 months every year allows time for the reefs this busy destination to recuperate. Visitors in this region can expect warm, tropical weather year round. Temperatures at depth are usually just a degree or two cooler than the surface, ranging from 78 to 84° F (26 to 29° C). Though a shortie offers plenty of protection, many divers prefer a full 3mm suit to protect against cuts and stings. Though visibility in the Similan Islands is excellent throughout the dive season, water clarity peaks between February and April. The viz here ranges between 82 to 131 feet (25 to 40 meters) but can be drastically reduced by blooming plankton. The Similan Islands are one of Southeast Asia’s most popular dive destinations thanks to their excellent conditions, a variety of budget options, and plenty of dive sites for beginners. 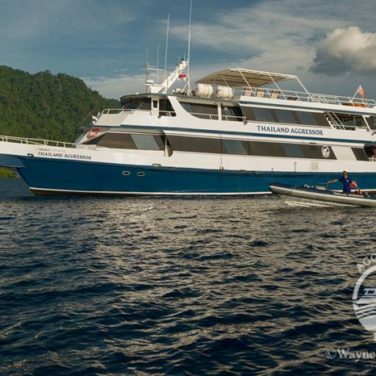 If you’re looking to book your very first liveaboard dive trip, this is a great place to get your fins wet. These islands are a protected national park, only dived during half of the year. This break keeps the reef in pristine condition and helps to support a healthy marine ecosystem in such a popular destination. The Similans are a great place to see a wide variety of coral and fish species, as well as big pelagics like sharks and manta rays. February through May are the ideal months to dive here if you’re hoping to see a whale shark, though chance encounters are possible throughout the season. And, if you’re planning to continue your dive education while on vacation, you’re in luck. 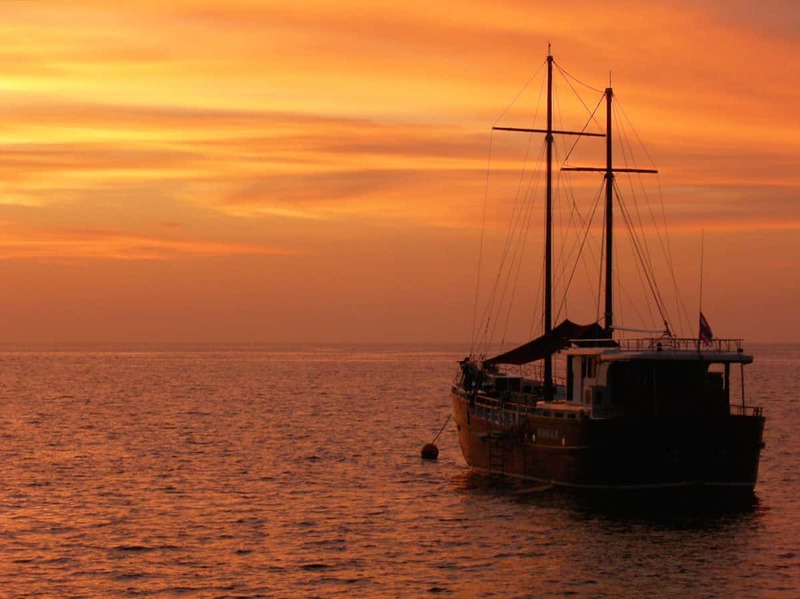 Many liveaboards offer advanced and specialty courses like Nitrox and underwater photography. Plan your visit at the end of February if you’re hoping to come face to face with the area’s most famous residents, whale sharks. Strong currents and blooming plankton invite the sharks to feed during this time. And, dive sites like Richelieu Rock are world renowned for their nearly guaranteed encounters during these months. While springtime is best for spotting feeding manta rays in this region, most dive sites around Koh Bon and Koh Tachai are reliable for sightings throughout the season. Resident reef mantas live here year-round, making the most of blooming plankton and busy cleaning stations. The Similan Islands are known for their gentle currents and calm conditions. 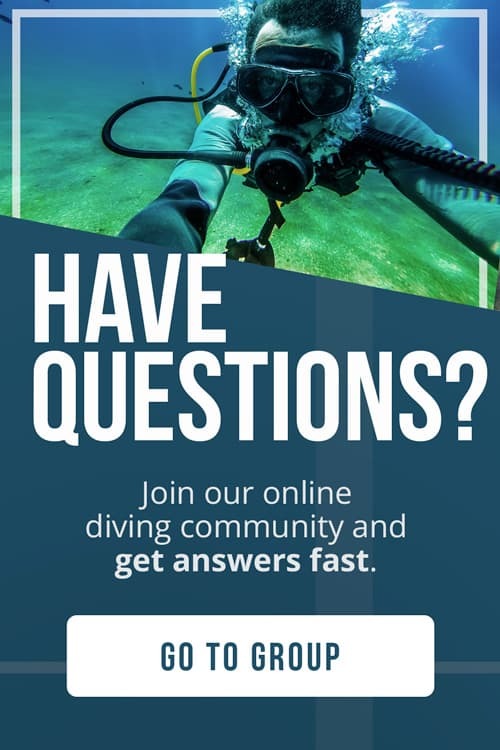 And, if you are new to diving in a current, this is a great place to learn. But, there are plenty of dive sites in this region that offer fast-paced underwater adventure, too. More advanced divers can head to the archipelago’s northern sites to get their adrenaline rush. Thailand is one of the most affordable places in the world to continue your dive education. And, most boats operating in the Similans offer courses onboard. Some dive sites in this region require advanced or deep diver certification, making them popular choices for divers looking to expand their knowledge. Nitrox and other specialty courses like photography make fun additions for more experienced divers. With most itineraries in this region lasting 4 to 6 days, the Similan Islands are a perfect destination for new liveaboard divers and tourists on a time crunch. These quick trips cruise the archipelago’s most famous sites, typically around the northern and central islands. While it is possible to book even shorter voyages, the more remote dive sites are some of Thailand’s most impressive. 2 and 3 day cruises skip these further flung areas. 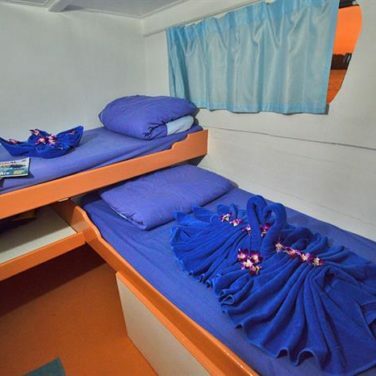 But, they are still a good value for backpackers, weekend warriors, and first-time liveaboard guests, and groups with non-divers. 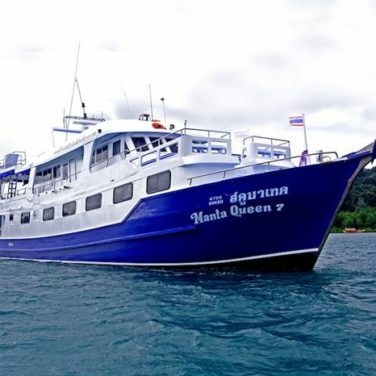 Virtually every liveaboard stops at Koh Bon and Richelieu Rock, no matter how quick the trip. More experienced visitors usually opt for extended itineraries. These longer trips combine the Similan Islands with other exciting destinations like the Surin Islands, southern Andaman Sea, or the Mergui Archipelago. Whether you head north or south will depend on your goals for the trip. 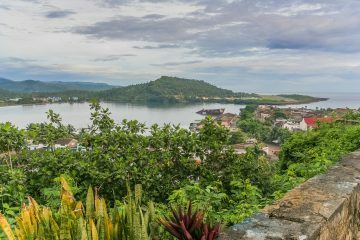 Northbound voyages exploring the Surin Islands and the Mergui Archipelago are ideal for seasoned divers. These trips visit some of the most remote and challenging sites in the region and are not appropriate for groups with non-divers or beginners. Keep in mind that an advanced certification and a minimum number of logged dives is required by most operators around Mergui. Meanwhile, southern routes through the Andaman Sea are perfect for intermediate divers. These trips, based out of Phuket, work well for groups with mixed experience levels, too. If you are hoping to visit specific dive sites like Hin Daeng and Hin Muang, or the wrecks around Khao Lak, you should confirm a detailed route for your voyage well in advance. No dive trip in this region is complete without visiting a manta ray cleaning station. And, the most popular dive sites to observe these graceful giants are at submerged pinnacles and seamounts around Koh Bon. These formations are a great place to spot other large pelagics like reef sharks and the occasional whale shark, waiting to be cleaned, too. Photographers should plan for wide-angle only adventure! Richelieu Rock is, without a doubt, Thailand’s most famous dive site. And, there’s a good reason for that. The rock has a little bit of everything and is suitable for a variety of skill levels. This submerged pinnacle is famous for its abundant soft coral, delicate macro life, and plenty of reef fish. Best of all, once a year, these waters are home to a massive gathering of whale sharks. If you are diving during March or April, this site is not to be missed! Most boats spend at least one full day in the area. The best northern dive sites around the Similan Islands, a series of submerged pinnacles, are among the park’s least visited and most pristine. Underwater tunnels formed by massive rock and coral formations create a maze of thrilling swim throughs and crevices. These caverns are a great place to spot napping pelagics. And, the shallows around these northern sites are excellent for photography. A variety of hard and soft coral, delicate macro, and rare finds like the leopard shark, make for a nice break from the big stuff. These thriving fields of hard and soft coral are a must-see for liveaboard divers in the region. Most sites begin with colorful shallows and gradually drop beyond 100 feet (30 meters), making them suitable for divers of all levels. Exciting macro life like nudibranchs and ghost pipefish live here in abundance. And, good natural light and excellent visibility create the perfect conditions for photographers. Even beginners and point and shoot users can expect outstanding results. In contrast with the rest of the park, most southern dive sites are comprised of submerged boulders and rock formations. Here, massive slabs of granite encrusted in gorgonian fans, sea whips, and coral, set a colorful stage for photographers. These are among the most challenging sites in the Similan Islands, thanks to their exposed position in the open ocean. But, you’ll find them well worth the challenge. Sharks, rays, and large schools of pelagic fish are frequently spotted here. Lucky divers might even spot a manta, or two! Though they are a separate marine park, many Similan Islands liveaboards visit the Surin Islands, too. These waters have less big fish than their southern neighbours, but their reefs are home to more species of hard and soft coral than anywhere else in Thailand. Unique creatures like pipefish, cowries, and ribbon eels make for exciting finds. And, photographers should plan to shoot mostly macro. 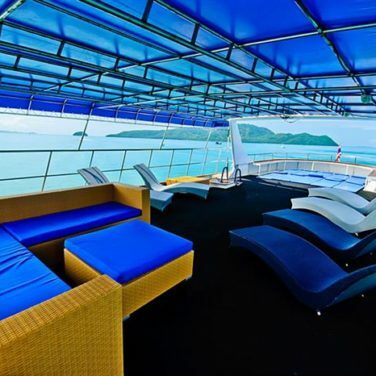 These days, most liveaboards bound for the Similans depart from Khao Lak. 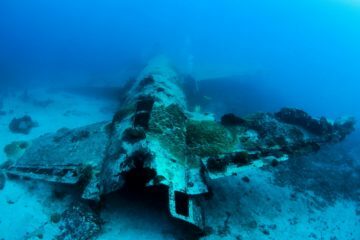 And, many spend a day exploring the region’s shipwrecks. The most famous, the Bunsoong Wreck, is really more of a rubble pile. But, this artificial reef is densely populated and entirely worth diving. If you’re looking for something more challenging, the nearby Premchai Wreck offers penetration routes and options for technical diving. Boats stop at these sites on either the first or last day of the expedition. Only a handful of boats offer combined itineraries that visit both the Similan Islands and the southern Andaman Sea, en route to Phuket. The most stunning stops along the way are twin dive sites, Hin Daeng and Hin Muang. These are considered among Thailand’s best wall dives, and both drop well below recreational diving limits. Manta rays, whale sharks, and massive schools of trevally are among the most exciting encounters you can expect here. Best of all, most boats stop at these plummeting formations for at least 4 tanks.